Planning permission was granted in 2017 for a new mobile phone mast to be installed on land at Reskivers just outside Tregony. Adequate mobile phone reception in Tregony has been limited to customers of EE who receive a signal from the transmitter at Trewarthenck. 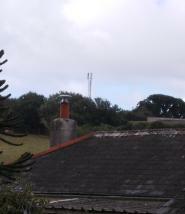 This new mast would serve the networks of Vodafone and O2. The overwhelming majority of the adult population are nowadays users of mobile phones and rely on them for many activities. This new mast will improve the service for a large number of local residents and visitors to the area. It should be operational soon.